I thought "flax" was a bit politer than vomit yellow, which even my children agreed was an accurate description. Not that the actual color changed along with the name. I don't actually hate this dress, by the way. I think it has some merits. For instance, it has no zipper. And I lined it. And it's warm. But here's the thing - this is a sort of a clingy knit. I knew this when I bought the fabric. I also knew that vomit yellow flax wasn't really a fabulous color to wear during the winter when everything is so washed out already. But it was all the fabric store had, so I decided I'd make it work. Sweater dresses, really, should be knitted, not sewn. But I don't knit, so I sewed it. I've been wanting a sweater dress for a while now, because they're so casual and comfortable and you can run after children in them. 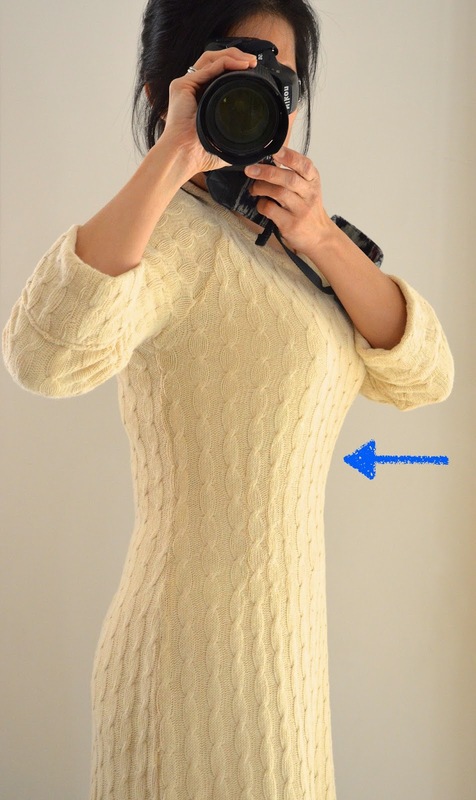 The challenge for me and sweater dresses is they're really designed for tall thin people; sure, short people like me can wear them, but the knit fabric is chunky to begin with, and thus weighs down unskinny people and shortens untall people. And, if you also happen to not be uncurvy, there is the very real danger of being er... misrepresented. I'm not talking about wanting to look pounds lighter - I'm talking about simply wanting not to look pregnant when one is not actually pregnant. Anyway, let's talk a bit about this sweater dress and then I'm heading out the door on errands. You might notice that I'll use the word "short" a lot, because I'm 5'3" and that, at least in dressmaking, counts as "short". Go ahead and say "petite" if you prefer, or "vertically challenged"; this is not about body image and social ideals, so don't take it so seriously - it's simply about mathematics and proportion and drafting. First, it has raglan sleeves. (b) especially on Short People. Second, it is short. People who shop in the petite section of clothing stores cannot have chunky dresses whose hems hit the knee or, worse, mid-calf. That's just depressing to look at. They can have maxi skirts in gauze and chiffon and so on, but they will look like barrels in anything in-between. Tall People do not have this issue; they have other issues like exposed ankles and long torsos and stuff like that, but they will very rarely have to worry about being mistaken for a keg. Even a large keg. Third, while it is dartless (and this is why we love sewing with knits), it has darting in the underbust region. 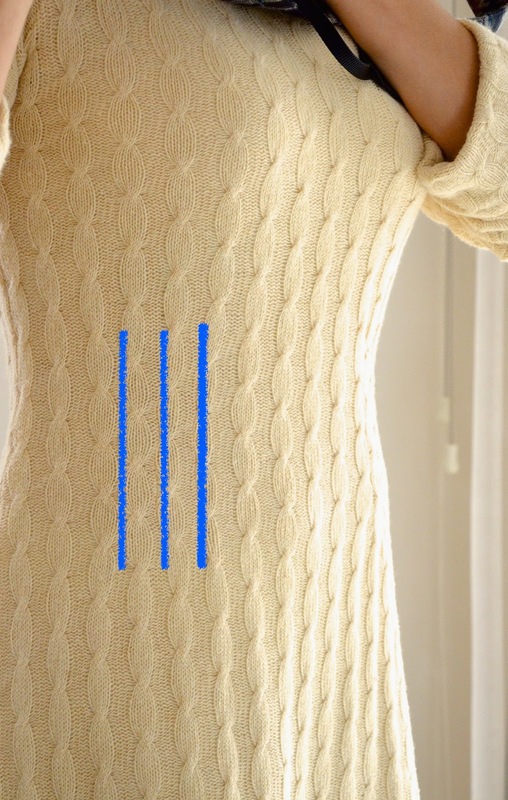 There are three pintucks on each side to shape the underbust area. When I was younger (and just as short), I used to think that Short People couldn't pull off the empire line because it was an automatic maternity look. I was wrong. In my defence, my flawed reasoning was the result of wearing store-bought empire line blouses that were made for Tall People who were also Thin People - you know, the aerated cotton kind with hundreds of gathers under the bust that look like you hitched a flouncy summer skirt up high and forgot to stop before it reached your armpits? Since then, I have learnt that a better Short Person's empire line is a fitted Aline beginning under the bust or a shallow pleat under the bustline. Or tiny gathers in light, thin fabric that does not manifest bulk. especially if those Short People are also Not Skinny People. By clean lines, I mean good shaping and good darting. Hence these underbust pintucks - just enough to shape the underbust area and define it as separate from the general chunkiness of the waist and the roomy ease of everywhere else. Thought I'd include that discussion here since we'd just recently introduced the idea of pintucks as a darting alternative to shaping. I prewashed this fabric but I know that it's going to stretch again as I wear it. So I might take this dress in a little more at the sides if I decide it's starting to balloon out of shape. Maybe. Currently, it feels like a fitted sack and I must say I like that feel. Incidentally, I don't mean to tell you how to dress, friends. I mean, for instance, if you make a sweater dress yourself and want to wear your belt right at your waistline, go right ahead. I wear mine, as many Short People With Short Torsos do, on my hip so I can pretend my legs don't begin just under my bust. And in case you like my hat as much as I do, I didn't make it (knitting/crochet ignoramus, remember? )- it's a $12 Banana Republic thing I picked up while shopping. Short People, I am happy to say, have same size heads as Tall People and can wear anything on them that they want. Hurrah. You look amazing in that dress. The colour suits you and is nice, you made it seem horrendous. So jealous of your sewing skills. It looks beautiful on you :) Love it, and I especially love how you added the pintucks to give it some shaping! I think it looks very chic on you, even the colour - and you don't look in the least bit gestational; I can't imagine you looking pregnant without the darts, but the darts DO make for a beautiful fit! Oh and BTW, even though I'm a tallish person (5'8") I also need to wear belts down low to look normal as my waist to bust length is very short - something I only realised when i started taking blog photos and saw how weird I looked with a top tucked into a skirt :(. I think the dress looks great and as usual you did a great job. Could you dye it maybe if you really don't like the color? Great fashion advice as well! How about butter yellow for the color? The pintucks are very clever. Love the dress! I wanted to knit a dress for quite some time but it feels like a very tedious project. After seeing your dress, I think i need to go to the fabric store. And add yet an other project to my to sew list. Sorry to disagree but the colour is a lovely cream-ish shade that looks beautiful on you. I don't think vomit at all! (If you've seen the insides of as many guts as I have, you'd have to agree.) The dress, of course, is created perfectly. Good dress, fits very nicely. The colour looks ecru or rich cream to me :-). I sort of think the same applies to medium height people who are fatter (I'm 5'5" and UK 16) though I did some tests out of a book once and have a balanced waist, so I do wear my belts at my waist as its the best place on me, and my hems just below the knee as frankly the knees need to be covered. I have an office job and have a couple of smart knit dresses I wear for work. I'm guessing sweater dresses are just a bit too casual? I love your beautiful dress! 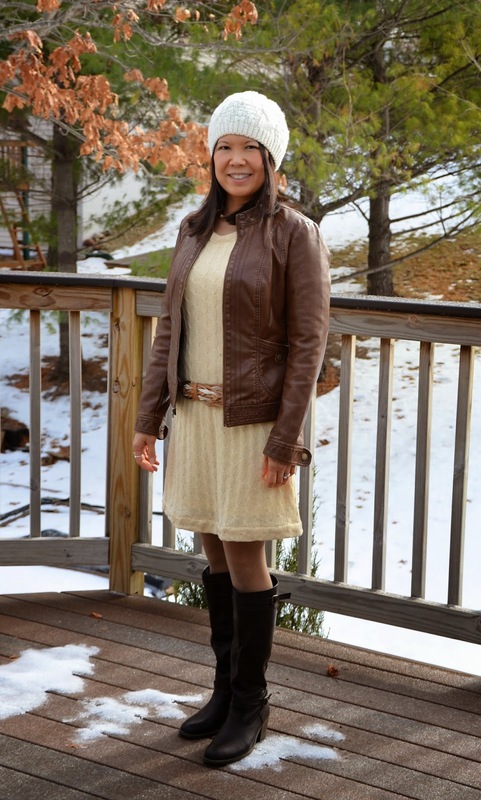 I think that creamy color is great in the winter - too many people wear dark colors. I myself am sick of all the black in my winter wardrobe. fascinating discussion on tall people. As a tall person, I am very envious of the myriad "petite" sections in clothing stores. I have yet to see a "tall" section and my sleeves NEVER cover my wrists. My height is one of the reasons I sew - so I can make clothes that fit me well. Thanks so much for this great post! I am very bust and have never thought of pin tucks in a knit like this, or even a woven with the right pattern to help shape a top or dress. Saving this post!! The pintucks are a great idea. They are very well hidden with this fabric.